James “Whitey” Bulger, murderous boss of the Irish-American organized crime gang in South Boston, will spend the rest of his life behind bars. Lenine “Lenny” Strollo, murderous boss of the La Cosa Nostra in the Mahoning Valley, is spending his twilight years in the comfort of his suburban home. Bulger, who viewed the killing of rivals and others who displeased him as just another day in the office, will die with only his demons at his bedside. And then there’s the issue of their ill-gotten gains, their blood money. Bulger, who was convicted a month ago of a slew of organized crime-related charges, including 11 murders, had $800,000 in cash confiscated by the federal government. 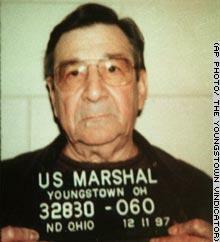 Strollo, who pleaded guilty to organized-crime related charges but then struck a deal with the feds to become a government witness, was permitted to not only keep his Canfield home, but did not have to give up any of the wealth he accumulated over the many decades that he plied his trade of death and destruction. There is a common denominator in this tale of two mobsters: The Federal Bureau of Investigation. Both men had a close relationship with the FBI, but while Strollo benefited from it, Bulger is paying the price for it. When the Valley’s Mafia boss was arrested as part of a wide-ranging federal investigation into government corruption and organized crime in the area, his blood oath of Omerta was quickly forgotten. Facing the prospect of a life sentence in the federal penitentiary, the man who was merciless in dealing with his enemies and rivals begged for mercy. His offer to tell all about the Mafia in the Mahoning Valley and in Cleveland, Pittsburgh, Chicago and even New York City was too good for the feds to pass up. The deal that was ultimately struck resulted in Strollo spending 12 years of easy time (for a cold-hearted criminal), during which time he testified in trials of individuals directly or indirectly involved in organized crime activities. He also provided the FBI and federal prosecutors with inside information about the mob. The federal government showed its appreciation by letting Strollo leave prison as rich as he was the day he went in. Bulger, on the other hand, was on the FBI’s Most Wanted list from 1994, when he disappeared after being tipped off that federal charges of racketeering were imminent, until 2011, when he was arrested in California. The feds threw the book at him. Not only had Bulger made fools of them by being on the lam for so long, but he publicly discussed a dirty little secret about the FBI. The boss of the Irish-American mob for two decades-plus was able to stay in business so long because he was one of the biggest informants for the FBI. He provided information about the Italian Mafia, which was the federal government’s main focus. In return, Bulger was permitted to conduct his business of murder and mayhem without fear of arrest. In fact, it was his FBI handler, Special Agent John Connolly, who tipped off the crime boss to the racketeering charges that were about to be filed. Connolly is serving 50 years in the federal pen for crimes linked to the Irish mob, including murder. Given its unclean hands, the agency is under pressure to prove that the deals it makes with unsavory characters result in bigger fish being caught. For instance, what information did Strollo provide that justified his being given a tap on the wrist for the crimes he committed for more than a quarter century? Or, what information is former Mahoning County Treasurer Lisa Antonini providing to the feds that justifies her being given a pass on her sentencing for taking money from a businessman and not declaring it? Antonini pleaded guilty in June 2011, but U.S. District Court Judge Sara Lioi postponed sentencing on the recommendation of federal prosecutors. Antonini will receive a reduced sentence if she fully cooperates with any federal, state or local investigations or prosecutions. In a sense, the FBI’s reputation is on the line in the Valley, given its deal with Strollo and its kid-glove treatment of Antonini.